Falls from heights of two metres or more is one of the leading causes of workplace deaths in Australia. If you or your employees don’t use the appropriate working at heights safety equipment you could add to the some 7,000 deaths from falling that occur each year in Australia. And even if those falls are not fatal, the cost of workplace downtime and injury recovery adds up to around $104,000 per person. Take responsibility for the safety of all your employees working at heights; it is a moral and legal requirement. Failing to ensure your workers are protected with fall arrest systems and working at heights safety equipment may make you liable under Australian workplace health and safety regulations. Workers working at heights must be protected from falls with certified fall protection systems; it’s the law. 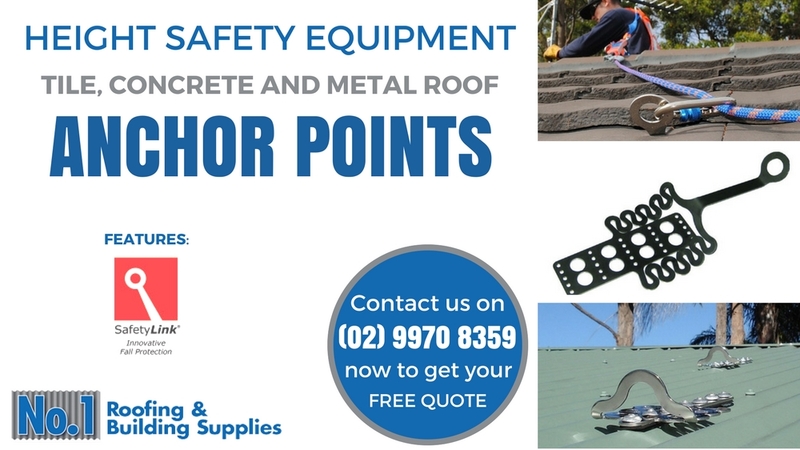 Adequate and dependable roof anchor points are the starting point for any roof safety system. But not all roof anchor points are created equal and not all anchor points are designed to meet every situation. It’s important to have the right anchor point for the roof type and the particular fall risk. SafetyLink –for utterly reliable, working at heights safety. Falls from heights can occur very easily; slippery surfaces, a moment’s inattention, over-balancing whilst carrying loads, and unstable and unsecured ladders. SafetyLink’s patented Fixed Ladder Link is the perfect solution for stabilising ladders and preventing sideways movement. The Fixed Ladder Link is designed as a permanent fixture sitting unobtrusively over the guttering. The bracket holds the ladder securely and also provides tie down points for added security. 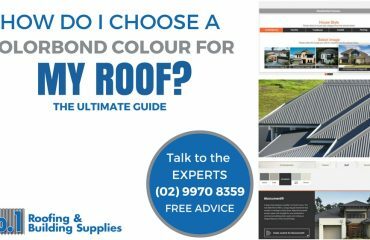 The bracket can be fixed under tile or steel roofing panels and the powder-coated marine grade aluminium construction will not rust or trigger the corrosion process with incompatible roofing materials. The powder-coated finish also allows you to add a top coat of your choice or leave it with its existing coat. The SafetyLink Fixed Ladder Link is your first step towards having a safe working at heights workplace. The FrogLink is a surface mount anchor for steel roofs. Seven gesipa bultite rivets are used to secure the anchor. The stainless steel construction and spring-like energy absorbing design allow it to easily absorb a single person fall impact of 15kN (approximately 1500 kg) from multiple directions. The SafetyLink RetroLink is designed as an easy to install permanent abseil anchor and fall protection system for steel roofs with steel purlins. The RetroLink derives incredible strength from the steel purlin mount. No access is required from underneath the roof as the anchor point can be inserted into the purlin through a single hole in the roofing sheet. The RetroLink eyebolt is made from 316 stainless steel, is tested to AS NZS 5532-2013 standards, and is rated to 15kN (100kg load falling from 2 metres) in multiple directions. The RetroLink is designed as a single worker anchor and requires no special tools for installation. The eyebolt’s ability to flex like a fishing rod reduces the loading on the roof and the impact on the person of a sudden fall arrest. The waterproof washer and O-ring ensure weathertightness around the fixing point. TileLink is a patented rafter mounted anchor designed to fit unobtrusively underneath tiles and protect against multidirectional falls. The mounting block sits neatly under the tiles and attaches to wooden rafters. The eyelet that sits outside the tile is virtually invisible. 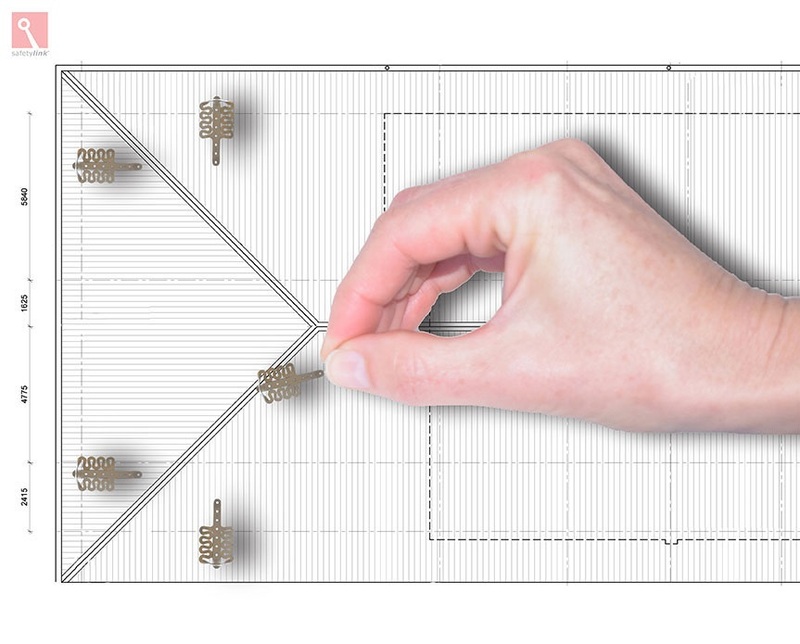 The TileLink anchor features a special shock absorbing design to reduce the impact loading on the roof and the worker. The 316 stainless steel design meets AS NZS 5532-2013 standards (rated up to 15kN for a single person anchor). Installation is straightforward making cuts into the sarking completely unnecessary. ConcreteLink is a surface mounted permanent fall anchor for concrete and offers a range of fall anchor insert options. The standard fall anchor is designed to absorb the energy of a single person falling. The 316-stainless steel eyebolt features a tapered design to transfer impact forces smoothly and minimise the load on the attachment and the falling person. You can also use the Abseiling eyebolt; the shorter design copes with a live load without the flex of the longer standard eyebolt. The collared eyebolt is a 3rd option that combines superior fall protection with a low profile for minimal visible disruption to the surface profile. A brass screw cap helps keep the ConcreteLink insert clear of dirt and debris when the eyebolt is not in use. The ConcreteLink must be chemically fastened and we can supply the tools required as well as testing equipment to verify that the anchor is fit and safe for its intended purpose. The TempLink 3000 provides superior working at heights safety for tile and metal roofs. TempLink3000 is designed as an easy to install temporary fall anchor for settings that may not justify setting up permanent anchors. The lightweight design for easy portability makes no compromises with roof safety. The innovative design absorbs the maximum amount of fall energy to reduce the impact load on the roof and on the falling person in multidirectional falls. It meets AS/NZS 1891.4 and will easily absorb 15kN. It isn’t only direct line falls that cause severe injuries; pendulum type falls (due to poorly designed or installed safety equipment) are also highly dangerous. All SafetyLink anchors are designed and tested for multi-directional fall loadings. Safety is too important to compromise through difficult installation procedures. A single line of attachment holes makes it simple to install SafetyLink roof anchor points and height safety equipment and reduces the margin of error. We also know how important it is not to compromise on roof weathertightness. Waterproof washers and O-rings provide the reassurance that the roof integrity is maintained as well. The AS NZS 5532-2013 standard covers manufacturing requirements for single-point anchor devices for harness-based work at heights. The standard has brought a much needed clarity and across the board reliability to the range of fall safety devices. 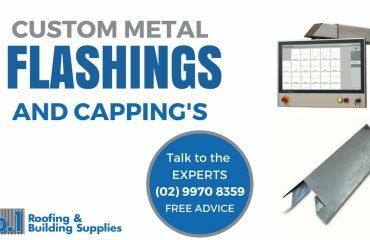 It ensures that all single point anchors meet acceptable loading levels. Anchors must be tested and proven able to absorb and hold a force of 15kN or the impact of 100kg dropped from two metres. This standard is part of the larger group of ASNZS 1891 standards that cover fall arrest systems. All SafetyLink roof anchor points comply with the AS/NZ standards. We can supply detailed testing results and product sheets. Falls can happen to anyone and they happen without warning. When you’re working at heights it pays to minimise the risk. SafetyLink products provide real safety assurance for you and your employees. Hydrajaws testing equipment (for concrete anchors). The staff at No1. Roofing and Building supplies can advise you on the correct installation and use of all SafetyLink devices. Individual / Contractor training can be completed by scanning the QR code on the instore display. If you need specifications on any of SAFETYLINK products or equipment please CLICK on the links provided.